Use these craft ideas to work on building speech and language with your child. These crafts are wonderful for eliciting sounds and words as well as working on repetition. Please note some of the pages may take a few seconds to load. It's worth the wait! 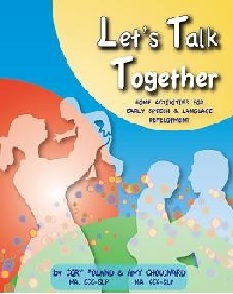 Resource information provided by artistshelpingchildren.org. Baby Chick - Make this adorable Baby Chick out of pinecones and other craft supplies. Very cute. Bird Buffet - Help your child make a Bird Feeder out of a Pinecone and an assortment of other foods birds love to eat. Bird Feeder - Instructions for making a bird feeder using pinecones! Centerpiece - Help your Toddler make a beautiful centerpiece out of pinecones. Your child will enjoy hearing all the wonderful comments people make about his or her beautiful centerpiece craft! Christmas Decorations - Make these amazing christmas decorations with your children out of pincones and other crafty items. Your children will love looking at their christmas artwork from year to year. Christmas Tree out of a PineCone - An easy-to-make pinecone Christmas Tree. Use it as a Christmas decoration or as a tree ornament. This is a simple craft that your young children can help make. Crafting Basics: Pinecones - Pinecones are one of my favorite natural treasures for crafting. They come in all sizes, and they are paintable, glueable and pretty. Here are just a few of the things you can do with pinecones to accent your crafts. Easter Tree - Instructions on how to make an amazing Easter Tree out of Pinecones with your children. This beautiful craft can be hung off a door knob or a gift basket. Glitter Pine Cones - This fun and easy craft makes a lovely Christmas tree ornament or it can be attached to the outside of a present to give it some extra charm. Glittery Christmas PineCones - Learn how to make these beautiful Christmas Tree Ornaments with your children. This is such a great craft to do with your kids. The kids will love making these ornaments and hanging them on the tree now and years to come. Holiday Pine Cone Bird Feeder - Make this Bird Feeder with your children. This festive Holiday bird feeder is made out of Pinecones, Bird Seed and Karo Syrup. Mice Craft - Make this adorable Mouse Craft using pine cones with your children. Nature Walk Mobile - Learn how to make a mobile out of items you find while you take your children on a nature walk... such as pinecones. PineCone Angel - Make this beautiful Angel out of Pine Cones with your kids. Pinecone Carolers - Help your children make these Carolers out of Pine Cones this Christmas Season. Your kids will have so much fun making this pine cone craft with you. PineCone Pony - Instructions to make a pony out of a pine cone. With just a few craft items you can make this very adorable Pine Cone Pony with your kids. PineCone Hints - When making things with pine cones, first bake the cones on a foil-lined cookie sheet for about three quarters of an hour at about 200 degrees... find out why. Pine Cone Repousse - Make this beautiful repousse out of aluminum foil, pinecones and metallic. Your kids will need help with this craft, but they will enjoy spending the time with you on this craft project. PineCone Skier Craft - This pine cone is ready to hit the slopes with skis made from popsicle sticks and it's wool hat! PineCone Wreath - Instructions to make a wreath using pine cones and a wire coat hanger. A fun gift idea or a great Christmas decoration. Reindeer Face Ornament - Help your child make this very cute reindeer face ornament out of pinecones. There is a hot glue gun involved with this project, so please make sure to do this part of the project and keep the glue gun far away from all children. Simple PineCone Ornament - Instructions to make simple, colorful pine cone Christmas tree ornament craft with your children. Snow People - use these suggestions to create a whole family of snow people with your children. These very cute snow people are made out of PineCones. Squirrel out of a PineCone - Instructions to make a squirrel out of pine cones. Your kids will love this craft. Tiny Toms - This is one turkey that won't get eaten this Thanksgiving. Your kids can make a flock to decorate the dinner table -- or for all the kid guests to take home as favors. Turkey Craft - This cute turkey is made from a pine cone, an acorn, and construction paper. It makes a very nice Thanksgiving table decoration. Turkey Craft 2 - From simple materials and with a little help cutting, your child can create their very own turkey pet this Thanksgiving!